Just to clarify, I have no issues with the fact that a lot of kids and their daddies & mummies like this film. The Steven Spielberg and Peter Jackson team has given a very serviceable animated adventure flick to see and forget (until the next time your tyke insists on watching). But if all you're getting out of an adaptation of Herge's perennially marvelous and entertaining comic book series is a serviceable one-time watch, it indicates a certain lacunae. To be honest, there will be some things inherently amiss with all motion picture versions of the Tintin comics. Much of the humor in the printed stories comes from the framing of the action, how a scene transitions from one panel to another, the joke concentrated in that concise staccato. Seeing those very actions expanded and articulated actually diminishes the fun. This was something that struck me even when I saw episodes from the Canadian cartoon TV series, arguably a far more faithful adaptation of the comics. The other aspect is that a still image, because it requires less repetitive labor and doesn't have to deal with the intricacies of fluidly transitioning from one frame to another, can be far more detailed than a moving image. Several of the larger sized panels from the comics feature lavishly depicted scenes of bedlam that reward you with fresh visual goodies as you cast your eye over each corner. Animated movies cannot afford to be so extravagant, since the frame is moving and they need to quickly set up areas of focus for the viewer. Also Tintin took advantage of many tricks of the comic book format, including the use of thought bubbles and halos reflecting the characters' emotions, that do not at all adapt well to cinema (check this panel as a slight example of what I'm talking about). These are of course shortcomings innate to any “motion picture” Tintin. The new film in particular suffers from being done with 3D computer graphics (referring to the rendering style here, not the need for 3D glasses, since I saw it “flat” at the old-school Regal cinema). Now I've liked a fair number of CG rendered and roto-scoped adventure films, mostly those by Pixar and some pleasant surprises like Monster House and the super-awesome Rango. I have little to fault in the technical wizardry of the visuals, the noir-inspired lighting in particular, but the Tintin comics have a very distinct visual identity that hasn't translated well to the 3D animated format. In comparison to their bright primary colors and exquisite caricature expressions, the film's visual palate is rather bland – I specifically think it was a mistake to try to render the characters in a more “humanized” way, if you will call it that. In contrast, one of the most fun bits for me was the opening credits sequence where they showed a stylized cartoon version of Tintin set to a jaunty period tune from John Williams (who then goes on to deliver a generic Spielberg movie score for the actual film, why?). The tone of the film is again mostly flat and lacking in the outright hilarity that makes the comics such a rewarding re-re-re-re-read. The jokes are far too few (Hot Fuzz's Pegg & Frost woefully underused as Scotland Yard's favorite bumbler sleuths)...and the script seems to specifically eschew the surreal and strongly flavored humor that distinguishes Tintin from other schoolboy's adventure comics – remember the scene where a hallucinating Haddock imagines Tintin to be a champagne bottle and tries to “uncork” his neck? Or the one where he gets drunk after they hijack the seaplane and insists on grabbing the controls, leading to their crash? All gone. The few highlights for me were Haddock's flashback of his ancestor's battle with Red Rackham and the hearty chase sequence in the second half of the movie, which successfully incorporate laughs with the thrills. The climactic action again disappoints, with Haddock and the villainous Sakharin seated in opposite cranes indulging in some Transformers-lite machine bashing. Ho-hum. So these are my general impressions. Truth be told, I had pretty low expectations for the film as a Tintin adaptation and they mostly turned out right. You can definitely see it (hold your kids up as an excuse) but I doubt most Tintinerds will eagerly look forward to the inevitable follow-ups on this franchise. Incidentally if you want to see Tintin adaptations apart from the cartoon series, try this live-action movie called Tintin and The Golden Fleece. 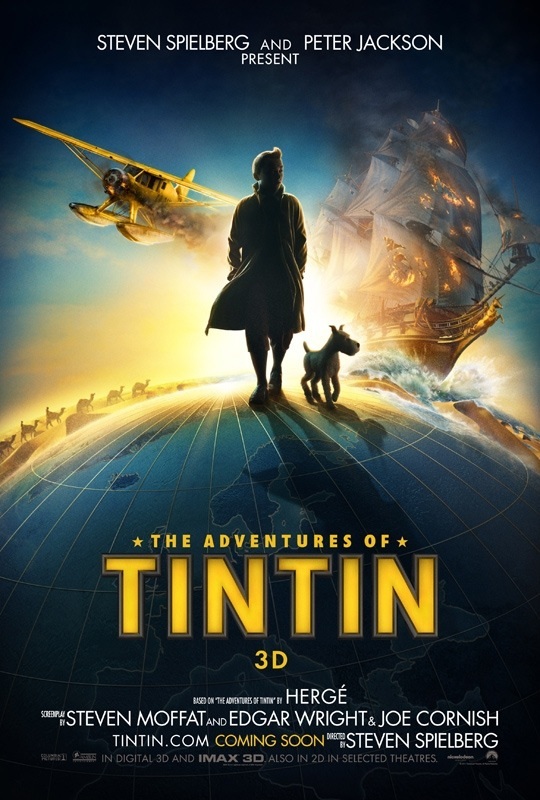 To be sure the budget isn't lavish, the actors wear obvious prosthetics to depict the characters, and the adventure is far more low-key than Herge's work, but in its limited way it does a better job of capturing that mix of action and wacky humor that characterizes the Tintin universe.